The Insta360 One X is ostensibly a compact action camera, but lacks the waterproof, ruggedised build you’d expect from a GoPro rival. 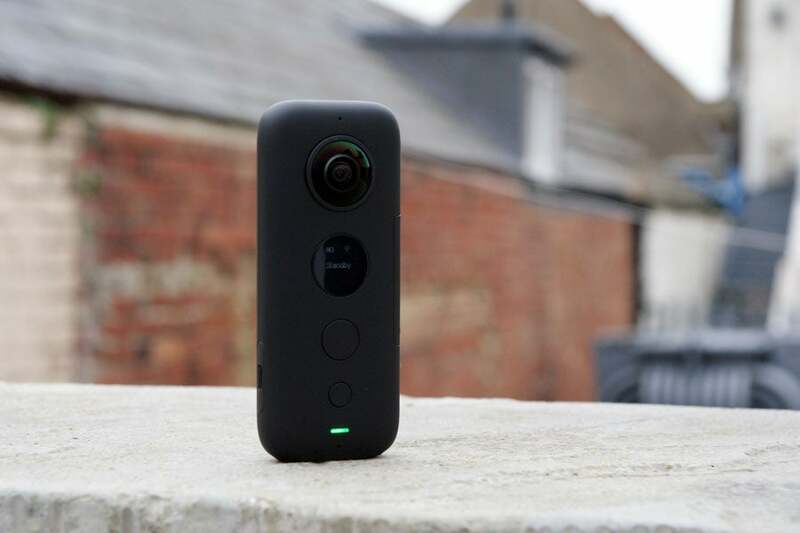 What it does have is a built-in and almost idiot-proof 360-degree setup thanks to a pair of 180-degree wide angle lenses and some very clever and easy-to-use mobile software. With it, you can capture time-lapse and hyperlapse videos, still photos and a variety of 360-degree video types at various resolutions and frame rates. With the mobile companion app, available for Android and iOS devices, you can edit these videos and photos on the move. Like the latest GoPro Hero 7 Black camera, it also comes with software-driven image stabilisation technology designed to make all your videos smooth and steady, no matter how shaky your hands or the terrain you’re traversing. The One X sports an elongated, rounded-off pill shape that’s both easy to hold and easy to pocket. At only 115g in weight and 115mm in length, it’s a pleasingly portable design. The upper part of the product features the two camera modules, one on each side, while below them on the front you’ll find a tiny LED screen and two buttons: one for power and quickly selecting shooting modes and options, the other for photo and video capture. With no on-board screen for previewing, it’s a very simple control setup, but you’re more likely to be using your smartphone as a controller – more on that below. The One X’s bottom edge is flattened so it can stand on its own, though there’s also a tripod mount. The bottom edge is flattened off slightly, allowing the One X to be stood on a flat surface, and there’s also a standard tripod mount. You’ll also find a microSD slot at the bottom, but with no card included in the box you’ll have to supply your own (capacities up to 128GB are supported, and Insta360 recommends cards of at least UHS-I V30 speed). Direct file transfer and charging duties are handled by a micro-USB slot on one side, while the removable battery fits beneath a door on the other. The One X isn’t sealed against moisture and dust ingress, which does dampen its out-of-the-box action cam capabilities somewhat. You can increase its sub-aqua survivability with the Venture Case (around £50, which adds five metre waterproofing) or Dive Case (around £80, which adds 30m waterproofing) accessories, but that requires shelling out extra cash on an already fairly pricy camera. While it’s not strictly speaking a requirement, the Insta360 One X app is essential if you want to get the best out of this camera. Available for Apple and Android devices, it not only gives you a remote control over the camera and its settings via either Wi-Fi or the included cables, but also allows you to quickly edit images and videos before exporting them to your photo roll, sharing them with friends or uploading them directly to social media platforms. You can make very basic edits to files – basically trims and filters – without transferring them to your device’s storage, but to make more complex and interesting edits you’ll need to do so. There are cables for connecting the camera to phones and tablets with USB-C, micro-USB and Lightning ports for quick transfer, but we found the alternative high-speed Wi-Fi option keeps things a bit less fiddly while still moving files fairly quickly. Once you’ve done so, you can trim videos, adjust picture settings, add music and filters and change playback speeds (including using various different slow- and fast-motion modes within a single video). The small LCD screen means you can operate the One X without the companion app, but the app gives you lots more options. You can also use FreeCapture, Insta360’s tech that allows you to ‘punch out’ a 1:1, 16:9, 9:16 or 4:3 frame from the 360-degree video, essentially pointing the camera where you want it to face and cropping out everything else for your final cut. You can add several FreeCapture changes to a single clip, which means you can point the camera at you for some of a video, then face it forward for a portion, then back to you and so on. It’s a powerful, necessary feature that helps you focus purely on the best bits of your 360-degree video. The app also lets you stop/start video and take photos remotely, as well as adjust image settings before you capture content, all of which is far preferable to using the camera’s on-board physical controls – particularly if you have the One X attached to a selfie stick. We used an Apple iPhone 6 as the companion device for this review, and while that’s an officially supported device, in all honesty we found it struggled to handle the sheer size of the One X’s 5.7K video files, with the app crashing more than once while we tried to watch and edit them. 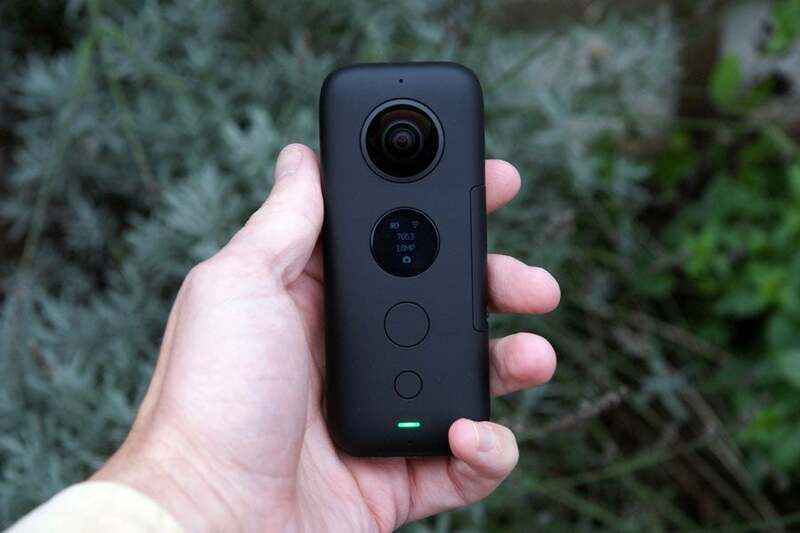 Dropping quality to 4K made things bearable, but we think Insta360 may be being a little optimistic by saying phones like the 6 and 5s are fully compatible with this camera; we’d recommend using it with a newer device. While you don’t get one in the standard box, a selfie stick is really a must if you’re buying this camera and want the best out of it. Even if you feel incredibly daft, self-conscious or narcissistic waving one of these wands about, the One X’s innate ability to remove the stick itself from photos and video is brilliant, and twinned with the excellent FlowState stabilisation (more on that below) turns a stick-mounted One X into something resembling a miniature drone – a hovering camera that smoothly follows you at a set distance. Invest a bit more in the bullet time handle (a bundle featuring both the selfie stick and bullet time handle costs about £55) and you can capture some truly eye-popping, Matrix-style shots. Attach the camera to the selfie stick and the selfie stick to the handle, then extend the stick and whirl it round your head; the camera will capture everything, then the software will set you as the focal point of the resulting slo-mo video. The selfie stick and bullet time handle were the only optional accessories we were able to try out during our review, but plenty of others are available: the aforementioned waterproof cases, as well as mounts for helmets, bikes, chests, arms, drones and more. The ecosystem isn’t quite as extensive as GoPro’s, but it’s getting there. Battery life is acceptable but not exceptional. If you’re recording a 5.7K at 30fps or 4K at 50fps, you’ll only get a maximum of an hour of footage before you have to recharge – and you can expect that to take around 100 minutes over USB if you’re starting from empty. As mentioned above, the battery is removable so those requiring more stamina can invest in extras (priced at about £17 each, which doesn’t seem too prohibitive). 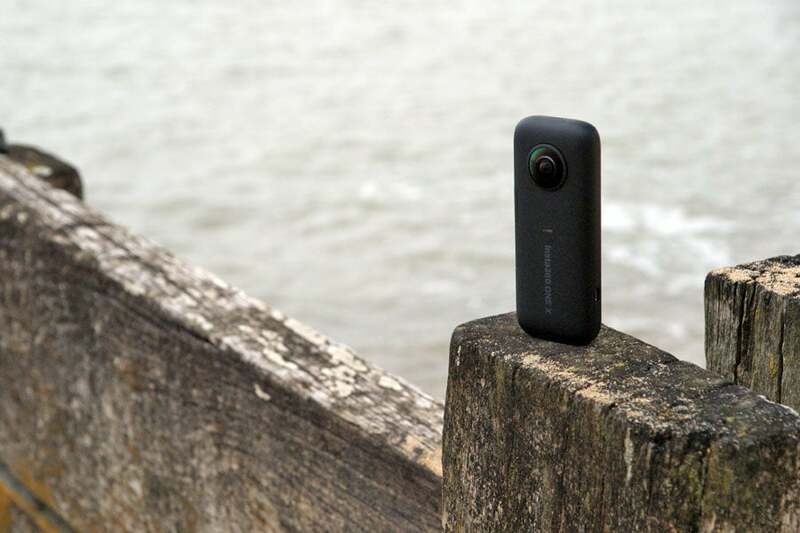 An action camera can get away with slightly blurry, noisy image quality – it’s the price you pay for its compactness, sturdiness and general go-anywhere flexibility – but the One X manages to deliver pretty impressive results, not to mention near-seamless stitching of its two cameras’ separate results. You can even record video in a flat log mode for post-production colour grading. Sure, there’s purple fringing around areas of high contrast, there’s lots of noise in low light situations and colours are not the brightest, but given the setup of ultra wide-angle lenses and small sensors, it was always going to be a trade-off between convenience and quality in which convenience wins out. If you’re looking for the best image quality straight out of the camera, a GoPro Hero 7 Black’s superior footage might make it seem like the obvious choice – but the Hero 7 isn’t a 360-degree camera, and it’s a closer call between the GoPro Fusion and the Insta360 One X. So close that deciding between them is more about considering features like the Fusion’s waterproofing and the Insta360’s more user-friendly app. Finally, a word about FlowState, the One X’s image stabilisation: it’s brilliant. Much like the HyperSmooth software stabilisation GoPro brought in with the Hero 7 Black, it basically recreates the effect of using a 3-axis gimbal, without the gimbal. So no matter how rocky your road, the One X’s footage comes out of the camera beautifully smooth and steady. Why buy the Insta360 One X? While not as tough as most action cameras (at least without spending extra on a waterproof housing) and more reliant on a companion phone than a GoPro, the One X’s excellent 360-degree modes and features and its rich in-app editing make it a great choice for those looking for new ways to capture their outdoor adventures. The GoPro Fusion might offer a more complete 360-degree camera package, but the One X comes close to matching it in many ways – and surpasses it in others. The post Insta360 One X appeared first on Trusted Reviews.